Milwaukee, WI. - Turnovers and untimely penalties plagued the Barnstormers for a second straight game, as Iowa fell 65-48 to the Milwaukee Iron on Friday night at the Bradley Center. 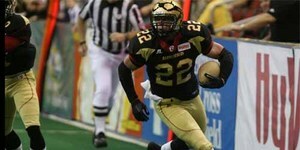 The Iron improves to 2-0 on the season, while the loss drops the Barnstormers to 0-2. Despite an efficient game from their offense, the Barnstormers defense could not contain the red hot Iron offense and QB Chris Greisen. Greisen threw for an eye-popping 382 yards and seven touchdowns. His favorite target on the night was Tiger Jones, who hauled in 12 receptions for 171 yards and three touchdowns. All-league receiver Nate Forse added three scoring receptions of his own. Vena was intercepted by Milwaukee DB Virgil Gray who returned the ball the length of the field for a 49 yard score which increased the Iron’s lead to 37-19. Iowa rallied in the fourth quarter, twice cutting the Milwaukee lead to ten points. However, Iowa was unable to close the gap during the games’ final minutes, ultimately falling 65-48 to the Iron. Next week the Barnstormers return to the friendly confines of Wellmark Blue Cross Blue Shield Field as they battle the Oklahoma City Yard Dawgz on Saturday, April 24. Please note that Saturday’s game has a special kick-off time of 8:05pm due to the game being televised nationally on the NFL Network. Great seats are still available and can be purchased at the Arena box office, online at www.theiowabarnstormers.com or by calling 515.633.2255.